Eric John Ernest Hobsbawm, CH, FBA, FRSL (/ˈhɒbz.bɔːm/; 9 June 1917 – 1 October 2012) was a British Marxist historian. He worked on the rise of industrial capitalism, socialism, and nationalism. His best-known works include his trilogy about what he called the "long 19th century" (The Age of Revolution: Europe 1789–1848, The Age of Capital: 1848–1875 and The Age of Empire: 1875–1914), The Age of Extremes. Eric Hobsbawm page at David Higham. Maya Jaggi, "A question of faith", The Guardian, 14 September 2002. Richard W. Slatta, "Eric J. Hobsbawm’s Social Bandit: A Critique and Revision", A Contracorriente, 2004. Interview with Eric Hobsbawm and Donald Sassoon: European Identity and Diversity in Dialogue, Barcelona Metropolis, Spring 2008. 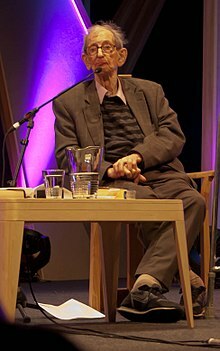 Eric Hobsbawm interviewed by Alan Macfarlane, 13 September 2009 (film). Where have the rebels gone? An interview with Eric Hobsbawm (video), Books & Ideas, 21 January 2010. World Distempers: interview with Eric Hobsbawm, New Left Review 61, January–February 2010. "Professor Eric Hobsbawm" on Desert Island Discs, 10 March 1995. Remembering Eric Hobsbawm, Historian for Social Justice. Eric Foner for The Nation. 1 October 2012. This page was last changed on 5 November 2015, at 00:15.